"A superb range of mobile games available"
"Love earning 'Comp Points' for every bet I make, win or lose"
PLAY NOW AT BET 365 CASINO! Bet365 came from humble beginnings, after being founded in a portable office in Stoke-On-Trent, UK in 2000. It has since grown rapidly with a very successful online sportsbook and is now one of the world’s leading internet gambling companies. Bet365 has kept its headquarters in Stoke-On-Trent, and has offices in Australia and Gibraltar where it is licensed. This guide to Bet365’s casino starts with an overview of the many games on offer before looking at the welcome bonuses and ongoing promotions available to players. Then available deposit options are looked at along with the ways to withdraw your profits off the site. Bet365 casino is now primarily run using PlayTech software. This is a respected platform in the industry and used by many of the ‘Euro’ sites. All games are available on the downloadable client, or you could access the games through the Instant Play option in your browser. There are also a limited number of games available on the mobile app. Bet365 boasts a large number of slots many which carry popular Marvel themes like Captain America or Spiderman. Other famous film tie-ins such as Rocky or Monty Pythons Flying Circus. These games have multiple reels and a vast number of win lines. They contain some great features such as bonus rounds, which are short arcade games where you control a character and can win extra prizes by completing the tasks. Many slots also contain progressive jackpots which are accumulated across PlayTech’s network of casinos, creating some impressive 7 figure prize pools. Many of the licensed themes also carry into Bet365 scratch card games. These are found under ‘Games and Keno’ where you can find Avengers scratch cards alongside fun alternative games like Bonus Bowling and Derby Day. There are also a large number of Video Poker machines to choose from. Of course the backbone of any casino is the table games. All the favorites are here with Baccarat, Casino Holdem alongside several different versions of Blackjack and Roulette. Bet365 hosts some unique games to Playtech such as Stravaganza and Tequila Poker. These games all feature authentic looking playing areas and gameplay can be really fast. 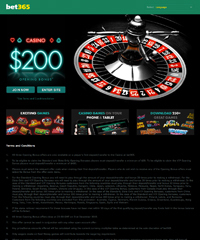 To really be taken into the full casino experience you may want to try out the Live Casino. Several games are spread here including Roulette and Sic Bo and you can watch the attractive dealers run the games and deal the cards via cameras. These games are generally higher stakes with £5 minimum bets and tend to operate on multiplayer tables. This adds another dimension to the experience as you can interact with both the dealers and other players, although when someone has a slow connection is can get frustrating. Bet365 features a welcome bonus offering 150% up to £150 for your first deposit. The play through requirements are only 20x the deposit and bonus amounts, however you are limited to a 30 day timeframe or else you risk forfeiting it. The play at most real money games are allowed to help clear it, although there are limitations. For example Keno bets can be used to clear 100% of the bonus while Casino Holdem only count for 5% - a full listing can be found under the terms and conditions. Once this is cleared the site also has regular deposit bonuses which are awarded every Monday and a Bankroll Boost which adds 25% up to £250 for any deposit or transfer. These both have similar terms and conditions to the welcome bonus, which are listed in full on the site. Bet365 runs a comps program, or VIP scheme, and a specialist Slots Club. These promotions continue to reward loyal players by allowing them to gain points as they play which can later be traded for cash. If you are a regular sports bettor or poker player on Bet 365 the site makes it quick and easy to transfer money between the different offerings. Should you do so make sure you check first if you are entitled to a bonus and enter the code otherwise you are leaving money on the table. Bet365 offer a wide range of options to get money on and off the site. The easiest of these for most people would be via a Credit or Debit card. Both Visa and MasterCard are accepted by the site. You can also deposit via an online e-wallet such as PayPal, NETeller or Skill, which is handy if you move a lot of money around online and do not want to enter your details everywhere. Withdrawals tend to be via the same method in which you deposited although if you cannot do this the site does provide many alternative options to get your profits to you.